CINCINNATI – Speckles and Paula – two female African penguins from Newport Aquarium – will serve as guest Harlem Globetrotters on Friday (Dec.27) during the legendary basketball franchise’s two games at US Bank Arena (2 p.m. and 7 p.m.). During the first quarter of each game on Friday, Speckles and Paula will visit with their new Globetrotters teammates down on the court and will be presented with custom-made Globetrotters jerseys. The two penguins were selected among Newport Aquarium’s eight African black-footed penguins that went through a Dec. 6 basketball try out with Globetrotters stars Wun “The Shot” Versher and 7-foot-4 Stretch Middleton, the third tallest player in Globetrotters history. 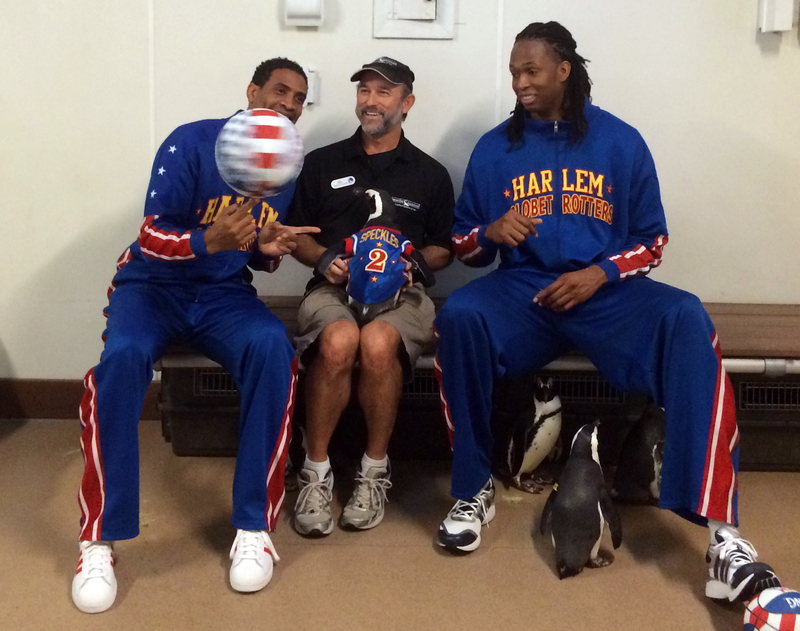 Harlem Globetrotters Wun “The Shot” Versher (left) and Stretch Middleton (right) with Newport Aquarium Animal Ambassador Ric Urban and Speckles from The Penguin House on Dec. 6, 2013. Newport Aquarium’s African penguins have delighted tens of thousands of people over the years; from entertaining guests at the daily Penguin Parade, to hosting folks inside their backstage home The Penguin House for Penguin Encounters, where a portion of the sales are donated to penguin conservation programs. Tickets for each game are available through www.ticketmaster.com and the US Bank Arena box office. For more information on Newport Aquarium and its African penguins, visit www.newportaquarium.com. This entry was posted in Uncategorized and tagged African penguins, basketball, Harlem Globetrotters, newport aquarium, penguins by NewportAquarium. Bookmark the permalink.